Polished 40mm rose gold case, in house automatic movement with date, and glass exhibition case back. 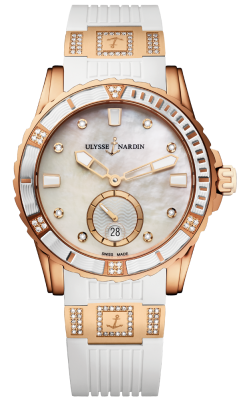 White Mother Pearl diamond dial. The case and rose gold elements are hand ser with 107 of the finest quality díamonds. 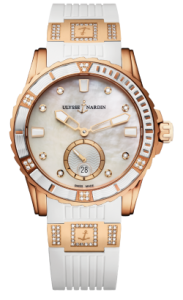 It is vailable on a sporty and elegant, white rubber strap with rose gold folding buckle.